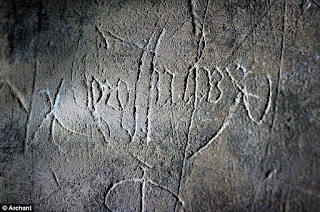 In the midst of all the Halloween madness around crazed-clown sightings (surely a PR stunt for the forthcoming Stephen King movie) and poor-taste celebrity costumes, my eye was caught this year by a request from Historic England for help with searching out some rather specialist graffiti. The patterns they are looking for date from between the the sixteenth and eighteenth centuries, can be found on both homes and churches and may be marks made by the builders or occupants to deter witches. We are a superstitious lot when it comes to guarding home and hearth.These marks (known as apotropaic from the Greek word for turning evil spirits away) are part of a long tradition of charms and curses stretching across cultures and centuries designed to keep homes and places of religious significance safe. The Japanese ofuda, charms written on paper and blessed at a Shinto shrine, date back to at least the seventeenth century Edo period. A nazar, a blue and white teardrop-shaped amulet, is a common sight outside homes across Turkey and Greece and is a legacy of the Turkish Ottoman Empire. Chinese door gods, or menshen, have been displayed on the entrances to temples and homes since the pre-AD Han Dynasty and any self-respecting house in Ancient Egypt would be guarded by the goddess Bast, depicted as a black cat. 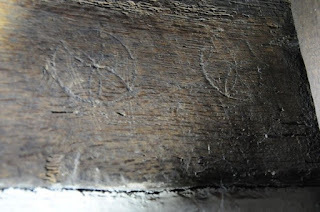 Apotropaic witch marks seems to be an English phenomenon and Historic England's treasure hunt request is directed particularly at secular buildings: although witch marks have been discovered on homes, these have, to date, been far less catalogued than those discovered at churches. So where do you look and what are you looking for if you decide to try and wean the teenagers of hunting for Pokemon? 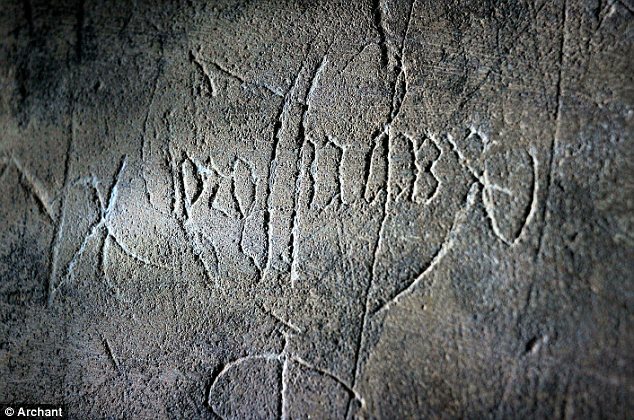 Witch marks of the type Historic England are hoping to catalogue are usually concentrated around entrance points such as doors, fireplaces and windows which are deemed as vulnerable to malevolent incursions. 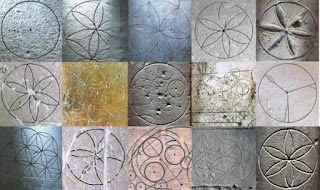 Marks can be in the shape of pentacles (sometimes lying on top of demons), inter-twined Vs and Ms for the Virgin Mary or, most commonly, compass-drawn hexfoils or 'daisy-wheels'. Whatever the shape, they do appear to share the characteristic of being formed from endless lines: apparently demons follow the lines and then get trapped, a plot device which a lot of films seem to have over-looked. Sites where marks have been found include Shakespeare's birthplace in Stratford, in roof beams at the Tower of London and carved into the timbers of a room prepared for a visit by King James I (a man obsessed with witches to an unhealthy degree) at Knole House in Kent. The scratchings are certainly intriguing although their association with deliberate attempts to ward off evil spirits is not a given: they could simply be marks made by masons to show how and where stones or timbers should be fitted or the product of apprentices learning the geometry needed for their craft. Perhaps, as with many superstitions, they started as one thing and became another. 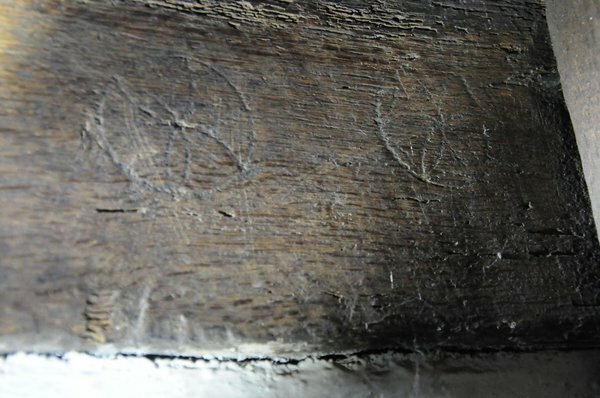 Whatever the truth of these marks, a belief has grown up around them that they exist as a protective measure, a belief it is not hard to understand in the context of communities living in genuine fear of witchcraft and in homes far darker than anything we can imagine in these days of instant light. The urge to guard against danger or ill-luck is part of the fabric of our buildings and some superstitions of the past still linger. Few of us, for example, would raise an eyebrow at a horseshoe nailed above a door, even if we no longer believe iron has the power to repel witches. Niels Bohr, the Danish scientist who basically sorted out quantum physics for the rest of us, had one on his house and, when asked if he believed it brought luck allegedly replied: of course not but I have been reliably informed it will bring me luck whether I believe it or not. It's a line of thinking many are probably still happy to follow, although I imagine most would draw the line at a horseshoe rather than employing the full range of charms available to our ancestors. A fear of magic implies a belief in its power. While witch marks and horseshoes are visible signs that a house is protected, some of the other methods used were far more secretive, perhaps because they had 'magic' in their creation. Repelling a witch is one thing, to be accused of being one yourself in the doing would be rather unfortunate. The stoppered vessels known as witch bottles for example, which have been discovered bricked inside walls particularly in houses in East Anglia, could be classed as a form of magic fly trap. 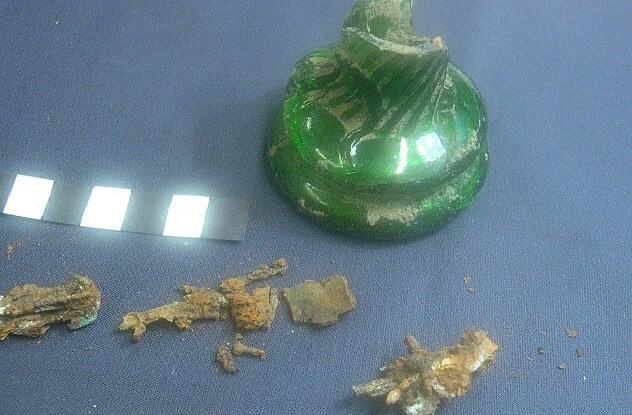 The bottles were intended to trap the witch who threatened the home-owner and contained mixtures of pins (to catch the evil), red wine (to drown it) and rosemary (to cleanse it away). If the identity of the witch was known, adding a personal touch, such as their urine or finger parings, made the magic doubly strong. Other, perhaps less dangerous, charms included fashioning the lintels over windows and doors from rowan wood and concealing shoes in the rafters and the hearth - this latter superstition apparently stemmed from the story of a priest in the thirteenth century who once trapped the devil in a boot. For the finishing touch, a mummified cat could be placed in the chimney breast - possibly an inversion of witchcraft as it uses the traditional witch's familiar to repel the danger. Protection is one thing but sometimes a stronger response to danger was required and charms gave way to curses. Examples of curses, essentially an inversion of magic/evil, have also been found in and around both church and domestic buildings. Curses which may be intended to direct the evil back at its perpetrator rather than merely block it do not need to be complex: witch marks have been discovered which are, apparently deliberately, incomplete, for example with a missing petal. Some curses, however, are very specifically directed: Roman-style curses in which the targeted person's name and the details of the damage to be inflicted have been found on church walls, including at Norwich Cathedral. The writing is corrupted, being inverted with the letters jumbled, hence the assumption that these are curses. Many of us feel like we are currently living in dark days. Whatever the truth of these marks, and no matter how difficult it is to really 'read' their intentions, they offer a fascinating insight into a world where fear of external dangers was just as real and the need to guard against them perhaps no different to our gated communities and lives lived under the shadow of CCTV. If this has wetted your appetite, Matthew Champion's wonderful book Medieval Graffiti: The Lost Voices of England's Churches is a really good read. I have that book! It's a fascinating read and has a lot of good pictures too. Masons' marks tend to be more based on straight lines, rather than the interlocking circles. Another idea is that they are taken from the consecration crosses placed on new churches. Maybe people were trying to confer some sort of similar blessing on their houses.